Yingwen was born in Beijing China and immigrated to South Africa at the young age of 8. He completed his undergraduate and postgraduate studies at the Univerity of Cape Town in South Africa. For his undergraduate studies (2004-2007) he specialized in Physics and Applied Mathematics and for Masters and Ph.D. (2008-2013) in Theoretical High Energy Physics. His Masters and Ph.D. research was completed under Prof. Dominguez and was on theoretically investigating the behaviour of quarks and mesons at deconfinement temperature. After deciding to work on something more practical for his postdoc, he moved to the Council of Scientific and Industrial Research in South Africa and worked as an experimentalist on Quantum Optics and Quantum Communications with Prof. Forbes and Dr. Roux (2013-2016). He is currently continuing his research work at the quantum photonics group with Prof. Karimi. 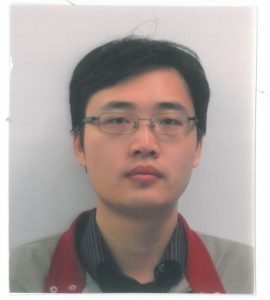 His research interest is in using the orbital angular momentum of photons to encode information for realising high-dimensional quantum communication and computing. Y Zhang, A Sit, F Bouchard, H Larocque, F Grenapin, E Cohen, A-C Elitzur, J L Harden, R W Boyd & E Karimi, Interaction-Free Ghost-Imaging of Structured Objects, Optics Express 27, 2212 (2019). F Bouchard, A Sit, F Hufnagel, A Abbas, Y Zhang, K Heshami, R Fickler, C Marquardt, G Leuchs, R W Boyd & E Karimi, Quantum cryptography with twisted photons through an outdoor underwater channel, Optics Express 26, 22563-22573 (2018). Hugo Larocque, Jérémie Gagnon-Bischoff, Dominic Mortimer, Yingwen Zhang, Frédéric Bouchard, Jeremy Upham, Vincenzo Grillo, Robert W. Boyd, and Ebrahim Karimi, Generalized optical angular momentum sorter and its application to high-dimensional quantum cryptography, Optics Express 25, 19832 (2017). Yingwen Zhang, Megan Agnew, Thomas Roger, Filippus S. Roux, Thomas Konrad, Daniele Faccio, Jonathan Leach & Andrew Forbes, Simultaneous entanglement swapping of multiple orbital angular momentum states of light, Nature Communications 8, 632 (2017). Yingwen Zhang, Shashi Prabhakar, Alpha Hamadou Ibrahim, Filippus S. Roux, Andrew Forbes, and Thomas Konrad, Experimentally observed decay of high-dimensional entanglement through turbulence, Physical Review A 94, 032310 (2016). Yingwen Zhang, Shashi Prabhakar, Carmelo Rosales-Guzmán, Filippus S. Roux, Ebrahim Karimi, Andrew Forbes, Hong-Ou-Mandel interference of entangled Hermite-Gauss modes, Physical Review A 94, 033855 (2016). Y. Zhang, F. S. Roux, T. Konrad, M. Agnew, J. Leach, A. Forbes, Engineering two-photon high-dimensional states through quantum interference, Science Advances 2, e1501165 (2016). F. S. Roux, Y. Zhang, Projective measurements in quantum and classical optical system, Physical Review A 90, 033835 (2014). Y. Zhang, F. S. Roux, M. McLaren, A. Forbes, Simulating quantum state engineering in spontaneous parametric down-conversion using classical light, Optics Express 22, 17039-17049 (2014). Y. Zhang, F. S. Roux, Modal spectrum in spontaneous parametric down-conversion with noncollinear phase matching, Physical Review A 89, 063802 (2014). Y. Zhang, F. S. Roux, M. McLaren, A. Forbes, Radial modal dependence of the azimuthal spectrum after parametric down-conversion, Physical Review A 89, 043820 (2014).